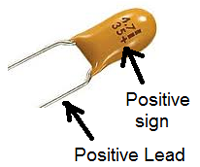 Usually the value of Capacitor is printed on its body. In Disc and Polyester capacitors, the value is indicated in PF, uF etc or as EIA code. But in some capacitors, the value is represented as coloured rings as in the case of Resistor. The value can be determined using the standard resistor colour code chart. Tantalum bead capacitor is identified in a different way with colour code.